Although the term armlet may be technically similar, it is taken to mean an item that sits on the upper arm: an arm ring. The origin of the term ‘bracelet’ is from the Latin ‘brachile’ meaning ‘of the arm’, via the Old French ‘barcel’. The in-line thin diamond bracelet that features a symmetrical pattern of diamonds is called a tennis bracelet. According to Diamond Bug, in 1987 Chris Evert, the former World No. 1 woman tennis player and the winner of 18 Grand Slam singles titles, was playing in the U.S. Open. She was wearing an elegant, light in-line diamond bracelet, made by jeweler-to-the-stars George Bedewi which accidentally broke and the match was interrupted to allow Chris to recover her precious diamonds. The “tennis bracelet” incident sparked a new name for the item and sparked a huge jewelry trend. Tennis bracelets continued to be worn by various tennis stars like Serena Williams and Gabriela Sabatini. A charm bracelet is an item of jewelry worn around the wrist. It carries personal charms: decorative pendants or trinkets which are signifiers of important things in the wearer’s life. In recent history, Italian charm bracelets have become trendy. While traditional charms dangle, Italian charms feature individual pieces soldered flat onto the surface of the link. Bracelets made from connecting or linking various or similar components or jewellery findings. 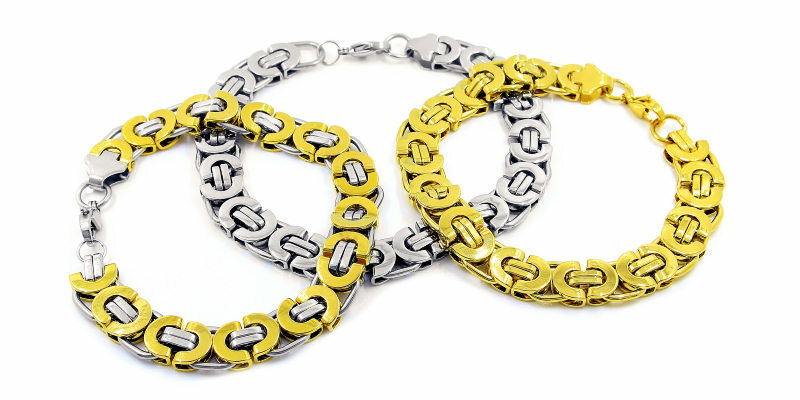 Link bracelets can be made of a variety of materials included metals and gemstones.